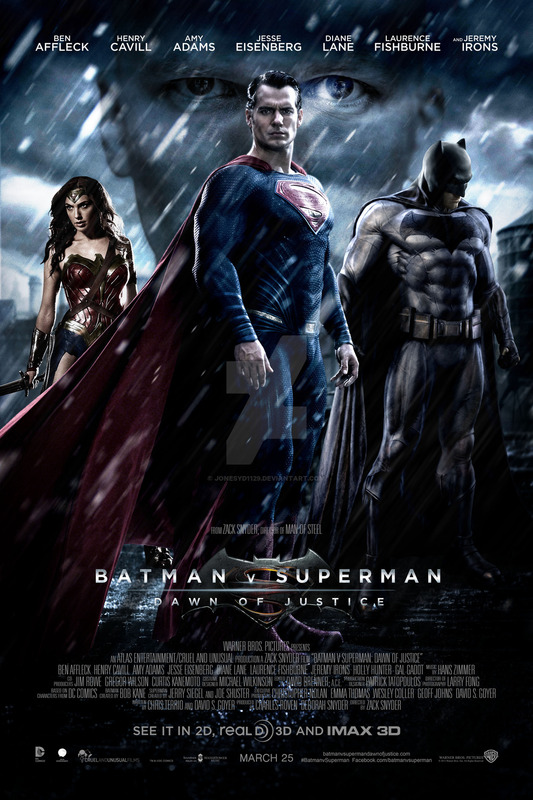 Starring: Ben Affleck, Henry Cavill, Amy Adams, Jesse Eisenberg, Gal Gadot, and more. Finally, the day has come where the much anticipated Batman Vs. Superman film is upon us. Comic book nerds, comic film fanboys, and the general film community have long awaited the release of this title since the announcement was made that it was in the works. General opinion has run rampant since then. Some calling for a rebirth of the DC film universe with this feature, some predicting a flop as many of the past films have fallen victim to, and some just plain out not caring one bit. The hype train has been nothing but a roller coaster ride as well. Some excited and some not, hype rising and falling for some as casting choices were made, rising and falling with the first trailers, falling incrementally with the release of the second trailer, rising impressively with the release of the last trailer, then splitting chaotically with the premiere showing but finally the predictions and speculations can come to an end. Batman Vs. Superman is now smashing its way into theaters and the results will finally come to the light. Hit or flop? You make the final call. Our story begins by following the story of Bruce Wayne (Ben Affleck) and how he becomes infuriated with Superman (Henry Cavill) due to the sheer destruction and death toll he is creating during his battle with General Zod. With so much pain and anguish caused by Superman, Bruce takes it upon himself to take on the God himself. On the flip-side of the coin, Superman/Clark Kent uses his alter egos to persuade society that Superman is not an enemy. The community is in a constant debate on whether Superman needs to be kept in check and whether he is a hero or if he is a curse. With this political quarrel going back and forth, Clark Kent is either making reports to prove Superman is a hero or he is dawning the cape as the God himself and attempting to show he means no harm and is only trying to help society. As the two heroes develop their stories which will ultimately clash at some point, another player is making waves in the background, Lex Luthor Jr. (Jesse Eisenberg). Lex plays puppeteer throughout the unraveling events of the film to pit Superman and Batman against each other but ultimately has to pull one last card once his first plan fails. This card is an extremely powerful and deadly one that requires a lot of man God power to stop. edit* After many conversations with individuals who enjoyed the film and have a positive mind on it. I have at least come to a level of respect for the film and what it tries to do. I still have a heavy distaste and disinterest for the film and still stand by it being horrid, IMO… I do, however, have left out what I think positively of this universe and the movie. That is the actors and actresses within the role. Affleck, Cavil, Gadot, and others, are fantastic. If they were given the proper material, aka, not Zack Snyder, they would thrive. Posted in 2016 Movies, DC Comics, Movie Review.Tagged Amy Adams, Batman, Batman Vs Superman, Batman Vs Superman Dawn of Justice, Ben Affleck, DC Comics, Gal Gadot, Henry Cavill, Jesse Eisenberg, Superman, Zack Snyder.